After creating a Preset Profile, you can update domains to match the attributes in the profile by adding them to the profile, allowing you to easily make bulk updates. Required: You can only add a domain name to one Preset Profile at a time. Click Organize, and then click Add to Preset Profile. 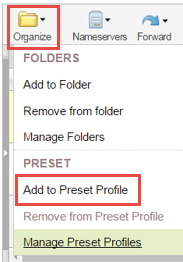 From Preset Profile, select the profile you want to use and click OK. Select the I certify . . . and I have read and agree . . . boxes and then click OK. If the Profile includes contact information that differs from contact information currently associated with the domain name, you might be prompted to select I authorize a 60-day rejection.... When prompted, you must authorize this rejection to proceed with the process. Note: Attributes of a profile override the domain's attributes. If you move a domain name from one profile to another, the domain's attributes change to match the new profile. If you don't include an attribute in the preset profile, that attribute does not update when you add domains to the profile. For example, you add your hosted coolexample.com domain name and parked example.com domain to a profile that does not include the Set Nameservers attribute. Both domain names retain their existing nameservers. That is, coolexample.com still uses hosted nameservers and example.com still uses parked nameservers.